In this article, we describe the context in which an international race towards Exascale computing has started. We cover the political and economic context and make a review of the recent history in high performance computing (HPC) architectures, with special emphasis on the recently announced European initiatives to reach Exascale computing in Europe. We conclude by describing current challenges and trends. Over the last several years HPC computing has become essential not only for big science applications and mission critical defence, but for almost any aspect of modern life and economy. This is particularly true after the advent of Machine Learning applied to Big Data. Obviously, the HPC systems need to be completely trustworthy. For this to be true the entire HPC ecosystem from the processors, communication and all the way up through the various software layers needs to be based on technology that is readily available, not subject to foreign export licencing, and completely trustworthy. For all these reasons as early as the beginning of the decade, all major developed regions have started to invest heavily in HPC technology. Particularly remarkable is the case of China, which started from scratch and, in a few years, has managed to become a major player in HPC and operates some of the top systems in the world. More traditional HPC players, such as Japan and the US, have also continued to invest and launch programmes such as the Post-K in Japan, and the Exascale Computing Project (ECP) from the Department of Energy (DoE) in the US. Finally, the European Commission recently announced the EuroHPC initiative to reach Exascale performance with European technology in the upcoming years. Besides the traditional mission critical applications of HPC, in the defence and security sectors, Exascale computing has enabled yet another major step for scientific applications. The unprecedented power of the latest generation of HPC systems allows the simuation of physical phenomena with high accuracy. Moving to Exascale, science will be capable of implementing simulation-based predictability. Computers will become in practical terms time machines capable to describe with almost no error what the future will be. From climate and weather prediction, to personalized medicine, to entire complex ecosystems. This evolution has convinced policy makers and governments worldwide that those countries which will own the most powerful HPC systems will dominate the international economy and rule the world. The potential impact on the society of scaling the performance of the most powerful computers of a factor at least tenfold in the next 3–5 years is considerable and strategic. European economy is already sustaining considerable losses from the important climate change of these last decades. The EU has established the Copernicus programme over 20 years ago. Today it is in full operation supported by a latest funding of 5.8 billions of € (B€). The system produces several 10’s of Terabyte per day of satellite information. This information needs to be processed in real-time and compared to the data produced by very sophisticated models. Similarly, in personalized medicine the need for supercomputing performance is great with obvious impact on the citizen wellbeing and the cost of health care, which is becoming a major issue in the increasingly ageing European society. Application landscape of HPC, generally characterized by a growing range but relatively slow in its evolution. Subsequent to HPC architecture design evolution, the programming paradigms have generally evolved to meet the requirements for approaching peak performance of the architecture. Figure 1 depicts the main drivers of HPC development in the last decades. 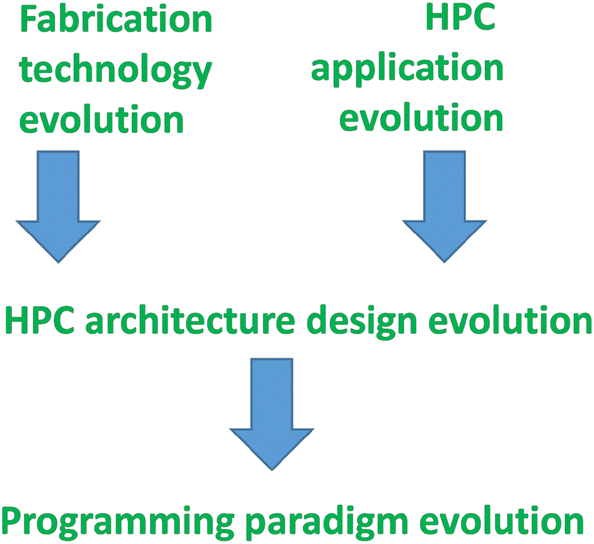 Here we analyse part of the HPC evolution from the above perspective, through a set of representative cases, in the view of establishing the expected way for European Exascale computing system development. At the end of the mainframe age, which had gone through more than two decades after World War II, many foundational ideas of modern computer science such as compilers, operating systems, floating point arithmetic, virtual memory and memory hierarchy, had already been conceived and experimented. Mainframes were general purpose systems, although the range of computer applications was limited with respect to the present idea of general purpose computer, and they had struggled for years with the limited memory capacity. On the technology side, bipolar transistors and emitter-coupled logic (ECL) families had been already adopted to boost the speed at the expense of power efficiency. With the advancement of memory technology and memory sub-system design, the memory address space size ceased to be the limiting factor for application development. On the application side, the presence of heavy matrix algebra processing in scientific and military applications opened the way for acceleration of arithmetic operations on vectors of real numbers. Instructions operating on vector operands, rather than the more conventional scalar operands, were introduced along with hardware support within the CPU for executing vector operations. Vector processors exploit data level parallelism (DLP), where a Single Instruction operates over Multiple Data streams (SIMD) (Asanovic 1998; Espasa et al. 1998). This constitutes the first representative example of hardware acceleration of computational kernels, especially in the form of dedicated and parallel (SIMD-organized) functional units and of dedicated vector register file. For this reason vector computers can be considered the first form of domain-specific machine. Vector machines appeared in the early 1970s and dominated supercomputer designs for two decades. There are two main classes of vector processors, depending on the location of their vector operands. Vector memory–memory architectures locate all vector operands in memory, while vector register architectures provide vector instructions operating on registers, while separate vector loads and store move data between memory and the register file. Some relevant vector memory–memory machines that appeared in such a period of time are the ILLIAC IV supercomputer (Barnes et al. 1968), the TI advanced scientific computing (ASC) supercomputer (Watson 1972), and the CDC STAR 100 (Hintz and Tate 1972) and successors (Lincoln 1982). In contrast, representative vector register architectures include the Cray series (Russell 1978; Cray Research 1984). These designs exploited DLP with long vectors of thousands of bits. Many applications can potentially benefit from vector execution for better performance, higher energy efficiency and greater resource utilization. Ultimately, the effectiveness of a vector architecture depends on its ability to vectorize large quantities of code. However, the code vectorization process incurs in several obstacles, such as horizontal operations, data structure conversion or divergence control. As a result, a significant effort was done in improving automatic vectorization of scientific codes (Callahan et al. 1988). However, autovectorizing large scientific codes requires the programmer to perform some degree of code annotation, modification or even complete rewrite. The progresses of CMOS technology allowed the growth of general purpose single-chip microprocessor performance, pushed by increasing clock frequencies and by microarchitecture advances, targeting the high-volume personal computer (PC) market during the 80s. Microprocessor speed grew faster than memory speed, which represented the first appearance of a memory wall limiting the performance. With the appearance of on-chip caches, made possible by the increasing scale of integration of CMOS, the initial memory wall was overtaken and the performance of general purpose complex CPUs, organized in multi-processor parallel architecture, became comparable with vector computer systems. Vector computers relied on specialized hardware boards composed of multiple integrated circuits. Because of their relatively limited market the development of powerful CMOS-based single-chip vector microprocessors was not justified. In order to maintain the pace with the speed of general purpose multi-processor, vector computers remained bonded to bipolar technology that again was not in the mainstream of semiconductor industry. More recently, a further significant advance on memory technology was the advent of eDRAM, allowing on chip L3 caches for example, thus pushing back the memory wall in commodity CPU based HPC systems [eDRAM]. On the application side, the market favoured the availability of general purpose parallel architectures that were not intrinsically devoted to a special class of algorithms like vector CPUs. The rise of massively parallel architectures based on off-the-shelf processors soon opened the way to shared memory symmetric multiprocessor and subsequently to the advent of distributed architectures to overcome the limit of memory bandwidth with respect to the traffic generated by multiple CPUs (the new memory wall). Cluster-based architectures, with multi-processor shared-memory nodes connected by different topologies and technologies of interconnection networks have represented the dominant paradigm of HPC systems for the last 25 years. On the software side, programming massively parallel architectures has produced a number of approaches and APIs (application programming interface) broadly divided into shared-memory paradigms and message-passing paradigms, with the support of compiler technology. The arrival of the power wall, due to the increasing power consumption density, has definitely limited clock frequencies in favour of the increase of the number of cores integrated in the same silicon die. This phenomenon has been characterized by technology node progress through geometry scaling, accompanied by voltage scaling (a.k.a. Dennard scaling), while maintaining practically the same clock frequency and increasing performance by augmenting the number of cores on the die. Yet, due to the need for acceptable noise margins in the logic gates, Dennard scaling has demonstrated to be unfeasible, thus slowing supply voltage scaling with respect to geometry scaling. This effect has led to the impossibility of further increasing the number of active cores on the die, again due to excessive power density, a situation known as the dark silicon necessity (Esmaeilzadeh et al. 2012). Dark silicon refers to the need of maintaining part of the silicon die inactive or active at lower frequency than the CPU cores. One main way of facing this design complication is the adoption of specialised hardware acceleration to dramatically gain in power efficiency. 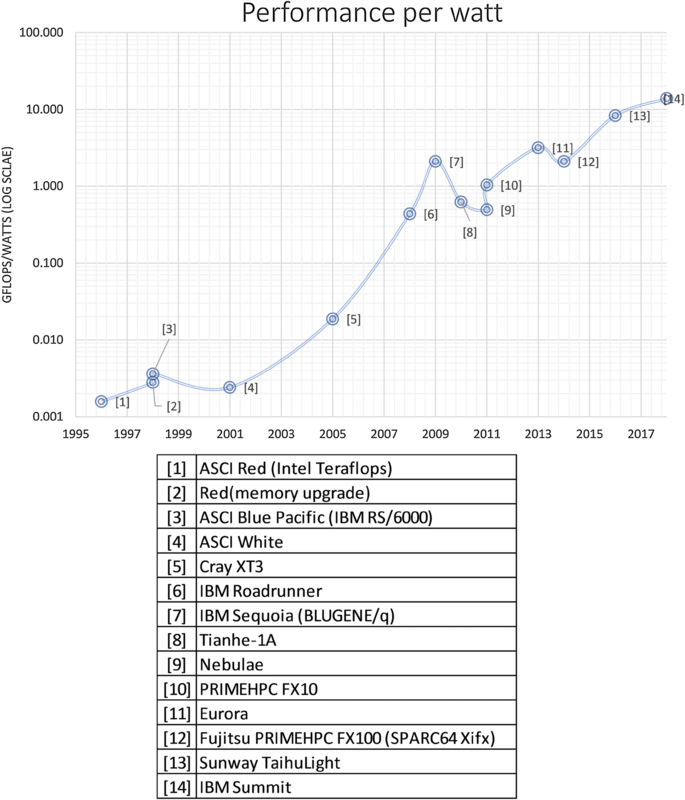 To clarify the real foundations of the above trends, Table 1 evidences the actual gain in efficiency of hardware specialization on a simple computational kernel. On the memory side, a decisive step to push back the memory wall has been the introduction of 3D-stacked DRAM technology created for graphic applications, basically High Bandwith Memory and Hybrid Memory Cube, which permit up to 512 GB/s data rate (HBM3). Leveraging on-chip hardware acceleration units that allow increased throughput at relatively low clock frequency, thus with considerably higher energy efficiency. 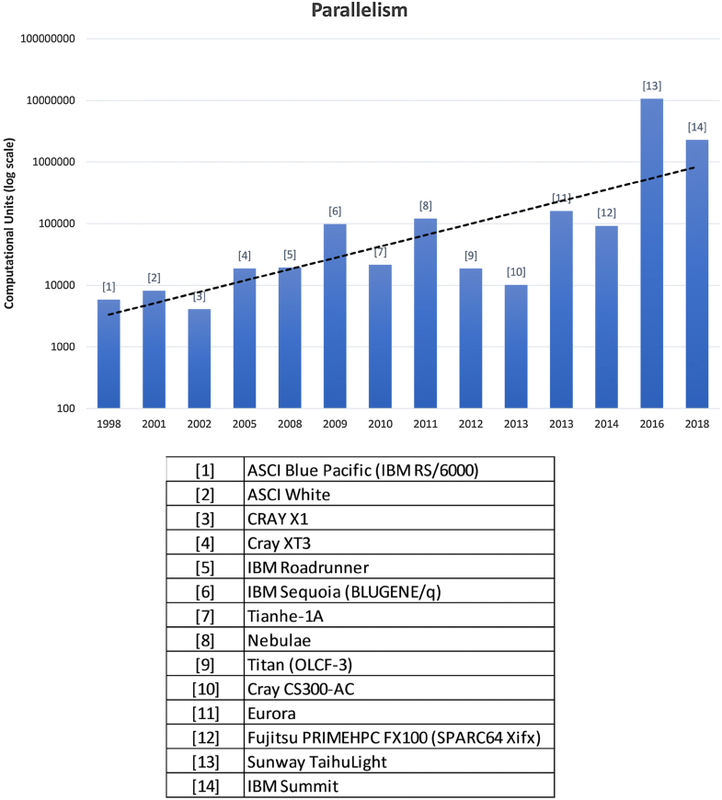 The first direction has been followed since 2008, with the development of the first supercomputer equipped with GPU (graphic processing unit) acceleration boards allowing a tremendous increase of parallelism while relieving the CPU from the highest computational load (Fig. 2). Notably, the advent of GPUs in HPC systems has been possible thanks to the availability of off-the-shelf top-level performance silicon chips fabricated for existing high-volume markets (high-end personal computers). This trend followed the same trend with the appearance of off-the-shelf high-speed CPUs in the HPC market 15 years before. The second direction of development of acceleration units, i.e. on-chip accelerators, while promising a new boost in performance, thanks to the less severe limitation imposed by data transfers, necessarily requires a similar support from a high-volume market in order to sustain the cost of dedicated chip design and fabrication, to avoid the decline experienced by vector architectures in the 90s. Yet, this opportunity will be provided by the emergence of new application domains, not traditionally related to HPC, which may benefit from the usage of such dedicated high-speed processing chips. Such applications are already widely documented and consist of Artificial Intelligence (Deep Learning), statistical analysis (Big Data), biology, etc.. Notably, in addition to extend the applicability of the HPC solutions to a larger market, the new applications also present particular requirements that demand attention by HPC system designers. Examples are reduced floating precision, integer processing, and bit-level processing. In this scenario, it is significant that big market drivers—like Google—are designing their own hardware solutions to solve their needs for high performance computing. On the CPU side, the need for higher power efficiency along with the availability of high-performance and established software eco-system in ARM architectures, have opened the way to ARM-based supercomputers in the search for less power consuming CPUs. In the last decade, the Barcelona Supercomputing Center (BSC) has pioneered in the adoption of ARM-based systems in HPC. The Mont-Blanc projects (Online: http://montblanc-project.eu/), together with other European projects, allowed the development of an HPC system software stack on ARM. The first integrated ARM-based HPC prototype was deployed in 2015 with 1080 Samsung Exynos 5 Dual processors (2160 cores in total) (Rajovic et al. 2016). The clear success of these projects has influenced the international roadmaps for Exascale: the Post-K processor, designed by Fujitsu, will make use of the Arm64 ISA (Yoshida 2016), while Cray and HPE are developing supercomputers together with ARM in the US. A special case of hardware acceleration units is represented by FPGA-enhanced systems. Some relevant examples of the adoption of this technology are already at a mature level of development. Most of such systems are using FPGA acceleration to cut down the communication latency in HPC networks—such as the case of Novo-G# architecture—leveraging the long experience of FPGA based routers. More generally, FPGA can be used at node-level processing acceleration, by reconfiguring data-paths within the FPGA connected to each CPU. This approach relies on the availability of the reconfigurable on-chip connections and on-chip memory structures within the FPGA, which in principle allows the exploitation of a higher degree of parallelism at the expense of one-order-of-magnitude decrease in clock frequency. An example of systems going in this direction is the Catapult V2 from Microsoft, which employs FPGA for local acceleration, network/storage latency acceleration, and remote computing acceleration. Yet the most interesting impact appears to be in network latency reduction. A rather exhaustive list of systems that have experimented FPGA accelerators in HPC systems and other related systems can be found in http://www.bu.edu/caadlab/HPEC16c.pdf. On the programming paradigm side, the advent of GPU accelerators as well as on-chip accelerators and possibly FPGA accelerators, has surely complicated the scenario. In general, this trend pushes towards a more and more collaborative development between the hardware and the software designers. In this scenario, a holistic strategy matches applications requirements with the technical implementation of the final design. In the last years, we have observed a rise in the popularity of novel programming models targeting HPC systems, especially focused on managing parallelism at node level. Parallelism between nodes at large scale still relies on the standardized Message Passing Interface (MPI). Traditional programming models and computing paradigms have been successful on achieving significant throughput from current HPC infrastructures. However, more asynchronous and flexible programming models and runtime systems are going to be used to support huge amounts of parallelism with the hardware. With that goal, several task-based programming models have been developed in the past years for multiprocessors and multicores, such as Cilk, Intel Threading Building Blocks (TBB), NVIDIA’s CUDA, and OpenCL, while task support was also introduced in OpenMP 3.0. These programming models allow the programmer to split the code into several sequential pieces, denoted tasks, by adding annotations to identify potentially parallel phases of the application. More recently, emerging data-flow task-based programming models allow the programmer to explicitly specify data dependencies between the different tasks of the application. In such programming models, the programmer (or the compiler) identifies tasks that have the potential to run in parallel and specify the required input and output parameters. Then, the runtime (or the programmer) builds a task-dependency graph to handle data dependencies and expose the parallel workload to the underlying hardware transparently. Therefore, the application code does not contain information on how to handle the workload besides specifying data dependencies. Representative examples of such programming models are Charm++, Codelets, Habanero, OmpSs), and the task support in OpenMP 4.0. Presently installed supercomputing facilities in Europe are examples of the above described evolution. According to the Top500 list published in June 2018, there are six systems installed in continental Europe in the top 25 positions of the list (The TOP500 List 2018). The Piz Daint supercomputer is the fastest European supercomputer with 25.3PFLOPS peak compute power with the Linpack benchmark. Piz Daint, resembling the accelerator trend, is a Cray XC50 system featuring nodes composed of a Xeon host and a Tesla P100 NVIDIA GPU accelerator, totalling 361,760 cores. The HPC4 supercomputer follows a similar approach, combining Intel Xeon hosts with NVIDIA Tesla P100 GPU accelerators. Other European supercomputers follow the general purpose trend, such as the MareNostrum supercomputer hosted by BSC, the JUWELS supercomputer hosted by Juelich, the Marconi-A1 supercomputer hosted by CINECA, or the TERA-1000-2 supercomputer hosted by CEA. The MareNostrum supercomputer is a general purpose supercomputer consisting of 3456 compute nodes; every node has two Intel Xeon Platinum 8160 processors, each with 24 cores and 96 GB of DDR4-2667 main memory. MareNostrum has a total of 165,888 cores and 390 TB of main memory. The JUWELS supercomputer, the Marconi-A1 supercomputer are similar in their design as well as in performance; based on Lenovo NeXtScale nodes featuring Intel Xeon Phi processors, totalling 312,936 cores (The TOP500 List 2018). The TERA-1000-2 supercomputer follows a very similar design with Xeon Phi processors totalling 561,408 cores. Installed supercomputers in Europe are still far from reaching Exascale performance, as this would require deploying a system 40 times more powerful than the Piz Daint. The path for building an Exascale system must take into account existing technology drivers and constraints. The latter come from the power wall, which means having the possibility of improving power efficiency. If we look at the trend in power efficiency evolution of representative systems, there is a clear exponential growth as shown in Fig. 3. This figure represents the energy efficiency in GFLOPS per Watt of the fastest supercomputer since 1996 according to the top 500 list. In the mid 90s, the largest supercomputers had a power efficiency of few MFLOPS/W. The fastest supercomputer in June 2018, the IBM Summit hosted at Oak Ridge National Laboratory already has a power efficiency over 10GFLOPS/W. If we take into account the trend in Fig. 3, we can expect future systems reaching between 33 GFLOPS and 50 GFLOPS per W, which would mean building a 20 MW to 30 MW system capable of one ExaFLOPS performance. There is evidence that further VLSI technology scaling is the way for achieving higher power efficiency (and not higher clock frequency) by allowing low voltage operation at similar propagation delay obtained with presently available technology nodes. The promising technologies for achieving this shift in power efficiency are 7 nm or 5 nm FinFET processes, getting close to 5 ps gate delay at 0.5 V supply voltage. In this perspective, it is not realistic for Europe to renounce leveraging non-European top-performance silicon technology suppliers, which in the present scenario appear to be Samsung and TSMC. In addition to processing devices, memory technology plays a primary role in reducing the Memory Wall impact, by the use of recently developed 3D-stacked DRAM solutions like High Bandwidth Memory (HBM). Such memory technologies provide a significant increase in memory bandwidth available to the processor, which is one of the main bottlenecks for future supercomputers. Notably, the opportunity of stacking the memory directly on the CPU is subject to further analyses when we consider 7 nm or 5 nm processes, due to the power density consequent to geometry scaling. On the architecture side, the European Union’s encouragement for a large range of applications, involving linear algebra computing, favours re-thinking dedicated solutions for vector processing. The present short-term effort spent by part of the EPI project (European Processor Initiative 2018) consortium in developing a vector accelerator tightly coupled to a RISC-V scalar core (see next section) goes in this direction, targeting pre-Exascale performance. In a medium-term perspective, novel solutions for hardware and compiler support for reducing the register access overhead of traditional vector processing are a credible way for reaching the 33 to 50 GFLOPS/W target, in 7–5 nm finFET technology node. The history of HPC shows that in order for supercomputer microprocessor to survive on the market, it is essential that they can share part of the high volume market of general purpose microprocessor. At the same time, the advent of Artificial Intelligence applications in the embedded system market has raised the demand for high performance computing capabilities in embedded processors. This demand is presently coming from cloud based computing services for embedded applications and will involve more and more edge computing devices featuring high computing power close to the final user or even to Internet-of-Things nodes. This reality opens a particularly favorable scenario for sharing horizontally the same computing platforms (instruction set architectures) in different contexts, ranging from the embedded market to the HPC market. In this view, the appearance of the RISC-V instruction set (Patterson 2018; Waterman et al. 2016) on the embedded system scene is of particular interest as it allows processor designers to join the high volumes of embedded solutions with the advantages of an open instruction set and software technology. RISC-V originated in 2010 from a research project at the University of California, Berkeley and is now supported by the RISC-V Foundation counting over 100 partners, among which numerous major industrial actors in the ICT market (http://riscv.org). It is composed of a base instruction set—divided into user and privilege set—that has been finalized and will never change, extended in a modular fashion by a number of dedicated instruction sets targeting higher performance or specialized application domains. The present status of the instruction set extensions is summarized in Table 2. Interestingly, there is a vector processing extension being defined, already at advanced stage of maturity. The RISC-V initiative inherits the long history of RISC processors started in the 80s from the research initiatives led by John Hennessy and David Patterson. In 2018, they received the ACM Turing award “for pioneering a systematic, quantitative approach to the design and evaluation of computer architectures with enduring impact on the microprocessor industry”. On the political side, the openness of the platform is of special interest in Europe as it may guarantee a total independence from US-based or Far East based intellectual property. In fact, while the RISC-V foundation is established in the US, there are already plenty of open source as well as commercial products based on RISC-V, making sure that RISC-V instruction set will remain always open in the future. At present, while several RISC-V commercial and open products are ready for the embedded market (Cheikh et al. 2019; Patsidis et al. 2018; Flamand et al. 2018; Schiavone et al. 2017; Keller et al. 2017; Gautschi et al. 2017; Olivieri et al. 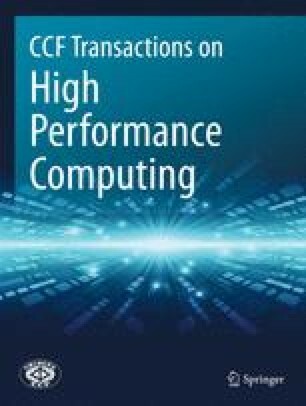 2017), there is limited availability of RISC-V HPC processors, either implementing vector computation (Lee et al. 2014, 2016; Zimmer et al. 2016) or targeting general purpose HPC applications. The 45 nm vector-accelerated Hwacha chip (Lee et al. 2014) achieves 16.7 Double-Precision GFLOPS/W, while the 28 nm FDSOI Hwacha chip (Zimmer et al. 2016) employs aggressive voltage biasing techniques to achieve power efficiency in variable load conditions. The U540 Quad-Core Processor [ROS18] addresses general purpose performance and exhibits a 6 GFLOPS theoretical peak at a 4.63 W board power consumption, showing the need for accelerator support to target breakthrough power efficiency. The EPI (European Processor Initiative) project (European Processor Initiative 2018), where the Barcelona Supercomputing Center is a main partner along with other 22, is the first significant effort in Europe explicitly addressing the goal of an HPC RISC-V microprocessor. One RISC-V tile of the EPI System-on-Chip, to be manufactured in 7 nm, targets a peak performance of at least 192 GFLOPS and a power efficiency over 30 GFLOPS/W, featuring a multi-lane vector acceleration engine addressing very long vector size. Looking further at a successive chip generation, we estimate that with a tile architecture based on superscalar cores and 1024-lane EPI-like RISC-V vector accelerators running at 2.3 GHz, employing SRAM near memory and HBM3 far memory, a system featuring 64 tiles per node and 4096 nodes may reach Exascale performance with an effective power (processing and communication) below 16 MW and total system power (including power supply chain and cooling) below 24 MW. Notably, the adoption of RISC-V is a key factor for having the maximum freedom in the development of the necessary acceleration technology, without limitations coming from hardware and software commercial eco-systems. Yet, the potential difficulty of adopting RISC-V in HPC relies in its intrinsic novelty. Due to the need of changing an entire software and hardware ecosystem, presently based on × 86 and GPU accelerators, it is unlikely that a RISC-V based Exascale machine will be ready in the short term. However, the possibility of reaching such goal in the mid term is realistic. In fact, BSC already experienced all these difficulties when starting the Mont-Blanc project in 2011. When the project began, no HPC software stack existed for ARM-based systems. After 7 years of significant efforts made by both industry and academia, we can state that the ARM HPC ecosystem is by now mature. The success of adopting RISC-V in HPC will depend on convincing more and more partners to contribute to this open source HPC initiative. In the last decades, the European Union has invested a significant amount of money on developing cutting edge HPC technology. The Centres of Excellence for HPC, the strategic research agendas developed by ETP4HPC think tank, the access to world class supercomputers in PRACE (Partnership for Advanced Computing in Europe), together with multiple European projects led by European industries, research centres and universities has positioned Europe as a world leader in HPC. However, there are no local European vendors capable of supplying EU customers with HPC hardware based on domestic supercomputing technology. As a result, Europe is currently purchasing all its HPC processors from non-European companies. At the major European funding agency event in 2015 in Lisbon, ICT2015, the EU Commission Director General, Roberto Viola, conveyed three top European scientists to discuss the impact of science on society. There, the director of BSC, Mateo Valero proposed to start a European plan for the Exascale race. DG Viola enthusiastically supported this idea and in the following weeks, the leadership of the Commission all the way to the President Jean Claude Junker confirmed the firm intention of Europe to enter in the competition with the rest of the world to reach Exascale performances based on European technology by 2023. At the Rome celebration of the 60th anniversary of the Rome Treaty, which established the framework for what later became the European Union, on March 23rd 2017 the EuroHPC initiative was lunched with the signature of the first 7 participating member states [The European declaration on high-performance computing (EuroHPC 2018). Up to date other 18 European countries have joined for a total of 25 signatories. In an unusually fast pace the Commission has managed to establish a specific instrument (Joint Undertaking or JU) for EuroHPC which has been officially approved by the European Council of Ministers on September 28th 2017. This JU will be funded with a first investment of 1 billion euros (B€) till 2020, to be followed by an additional investment of 2.7 B€ in the next funding phase of 2021–2027. This level of funding is in line with what the other developed regions of the world have announced. As a first action a specific funding grant of 120 million euros (M€) has been allocated to a consortium of 23 partners to develop in the next 3–4 years a European processor. The initiative has been named European Processor Initiative (EPI) (2018) and accepted for funding by the Commission on March 23rd. Three lines of development have been so far proposed: (i) a general purpose processor and common platform that will leverage existing technology to deliver high performance systems in the short term; (ii) an accelerator based on RISC-V ISA that will develop a complete European design in the mid term; (iii) an automotive processor that will provide a high performance system suitable for future autonomous cars satisfying real-time constraints. The Barcelona Supercomputing Center will contribute to the three designs aiming at developing European high performance systems for different markets, including HPC, deep learning and automotive. BSC will leverage the experience from the Mont-Blanc and other European projects to deliver a high performance general purpose processor. Moreover, BSC is leading the development of the RISC-V accelerator together with other academic and industrial partners. Another important aspect of the European HPC strategy is the European Open Science Cloud (EOSC) as a vehicle to provide access to the entire European Scientific Community especially to the less affluent normally referred to as the long tail of research. A considerable amount of funding, in the order of 300 M € for the reminder of the H2020 programme (till 2020), has been allocated to develop a strategy and implement a roadmap for scientific data sharing. The official launch of the European Open Science Cloud took place in Vienna on November 23rd, 2018 (European Open Science Cloud, EOSC 2018). Europe has a long way to go to obtain complete independence in the HPC market, traditionally dominated by US and Japan. The tremendous progress by Chinese scientists and industry in the last decade clearly demonstrates that with adequate resources and well-focussed planning it is possible to fill the gap and count in the top players. Clearly, Europe lacks a large domestic industry in HPC, but a significant part of the HPC ecosystem already exists and on the research side several centres have the necessary competences to develop processors and the other components necessary to commission large Exascale systems. The economic landscape is complicated by the presence of international global vendors that have traditionally dominated the European HPC market. Differently from the US, Chinese and Japanese markets, essentially closed to foreign vendors, the European one is completely open. It will not be easy for the Commission to privilege an emerging domestic HPC industry in the European procurements. The fragmentation of the EU in at least 27 member states, assuming the exit of the UK, is another fundamental problem. Any major initiative needs the approval of the majority of the member states making the investments often not very effective. In any case, for the first time in many years the strategic importance of Europe gaining a leading place in the worldwide Exascale race has been recognized. It is now up to all the stakeholders from the public and private sectors to make this wish a reality. The Barcelona Supercomputing Center will make its best for this vision to become a reality. The authors are grateful to Peter Hsu (Independent consultant) for his valuable technical advice.